A felicitation programme by Rotary Club of Port Blair was held at Fortune Resort Bay Island on Saturday the 13th Aug,2011 to honour the Island Toppers of the CBSE Class 12 exam 2011. The Director of Education Shri.R. Devdas was the chief guest of the function. This year the club decided to honour the toppers of all the three district viz. Nicobar, North & Middle Andaman and South Andaman Districts. The students were presented with a cash prize and certificates. The Rotary Club of Port Blair also presented with a Rolling trophy to the top two Schools of the Andaman & Nicobar Islands that produced the Island Toppers, Carmel Senior Secondary School bagged the Top School and Vivekananda Kendra Vidhyalay bagged the 2nd Top School, the trophies were collected by their respective Principals. Speaking on the occasion the Director congratulated the students and their Schools and encouraged the students to not only excel in their academic field but also to be a good human being. Rtn. Zakir Jadwet President and Rtn. 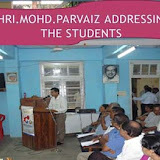 Girish Arora Secretary along with members of the Rotary Club of Port Blair were present in large numbers to encourage the students and motivate them to become good citizens.